Today is one of those days where I just feel compelled to post and share a slice of life with you. Often I've learned that these compulsions are a result of someone else needing to hear that we are in the same boat, unified in our struggles as humans trying to love Jesus. This year so far has been tough. I won't lie. The first two weeks or so weren't bad, but from there it's been downhill. Death, illness, finance issues, struggles. Don't get me wrong. I realize fully that in the midst of struggle there are always lessons. Just like in a field of wildflowers there are thorn bushes. It all depends on what you are dealing with currently that aides in your interpretation. I love the learning, hate the teaching. Love the flowers, hate the thorns. My words for the year are "freedom" and "confidence". Choosing a word for the year always seems harmless enough but when you fully commit yourself to it, you learn, the road to those goals is never straight or easy. My word last year was patience. Oh man. That was tough. I felt as though every opportunity led me to exercising this skill like a weight lifter constantly adding weights to his bar thingy (that is totally what it is called right?). But at the end of it, I DO feel like I'm growing in that area. For sure. So I am learning the path to freedom and confidence. Just think about those words for a moment. It's not easy to pinpoint just where or how those skills would be exercised right? How does one learn freedom? (I might have to address confidence in a later post). I'm learning that we learn it by giving it. I was thinking last night as I fell asleep about the things we hand out in a day in terms of thoughts and actions. What's the quickest thing that we give away, all day every day? Judgment. What's the slowest to come to mind? Grace. Those two things seem to set the scale of "speed with which dispensed" with Judgment setting the pace for fastest and Grace the slowest. Why the heck is that? Aren't those the things we want the least and most? We are extravagant with judgment and stingy with Grace. Wait, what? Isn't that the total opposite of who we strive to be like? I know that is the case for me. I want to be like Jesus. Judging not and smothering people in Grace, just how I want to be treated. Once again, I've been dealing with people copying my work. I will admit that it is endlessly frustrating and difficult, not to mention anger inducing and heartbreaking. Mostly because people think two things are true: 1)If everyone on Etsy is doing it, then it is OK and 2)If you find an idea on Pinterest, it's up for grabs. Yes, there is a HUGE cloud of people who think this justifies their actions. I've dealt with it enough that I could write their responses to me. Over and over I've gone down this road. Why? Because I LOVE my job, love my creations and this job pays my bills, feeds my kids, helps ministries and friends. It means a lot to me. In the past I've put a lot of energy into trying to get people to see that it's not ok to copy anothers work, no matter where you find the idea. And I've recently discovered that it is a losing battle. One I will never win. Never or ever. It's taken me some time (as any good lesson does) but I know now that that kind of work is about as useless as Sysiphus'. Once I get that rock up the hill, it's only going to come back down on me. So, I'm gaining freedom by giving it away. I am freeing myself from trying to get people to understand my side of things and am going to focus on just living. Creating to the best of my ability. Increasing my product quality and ingenuity. Focusing on the business God has given me and letting those who copy it be dealt with by a higher power. I am freeing myself from trying to regulate anyone and that gives me freedom in time and thought! Because let me tell you, that kind of work takes a lot of time, energy and emotion. It just TAKES. Freedom GIVES, it fills, it overflows your ability to just LOVE. It seems that we gain freedom when we give it away. And if I were an English teacher I would point out that it takes action. You cannot GIVE without effort. Since our human tendency seems to be to GIVE judgement it would seem that to do something against our nature, as humans, will take great effort. I'm guessing it will take me some time, focusing on this work, day in and day out before it feels even remotely natural. Because wrong FEELS wrong and we want to RIGHT it. The truth is that we can't. We have zero control over others. BUT we can give them freedom. Freedom from our judgements and criticisms. Freedom to go on about their life, having FREEDOM in knowing that God sees all and knows all. All of our rights and WRONGS. The great thing is, that the more we exercise restraint in judgement the more freedom we have to give grace. We need to make OUR business our ONLY business. And our only business is to LOVE. Love and grace go hand in hand. And unless LOVE is the fiber of a relationship, your judgment wont be heard ANYWAY! What a duh moment for me. Who are the people who seek our advice (judgment per se)? Those who LOVE us, who trust us, who take measure in our opinion. Who doesn't seek our judgment? Strangers. Who don't care or love us. Without LOVE, judgments (or opinions) are not taken as lovely. If you haven't chosen a word to focus on for the year, I highly suggest it. It's an amazingly simple way to get complex results in your life. Simply pray about it. Think on it. Ponder it. And choose a word that will give you focus. And then SEEK it in everything around you. Look for lessons and you will find them there. We all need a little focus. A clear photo of the person we want to become. We can all use a little shining, a little freshening up. 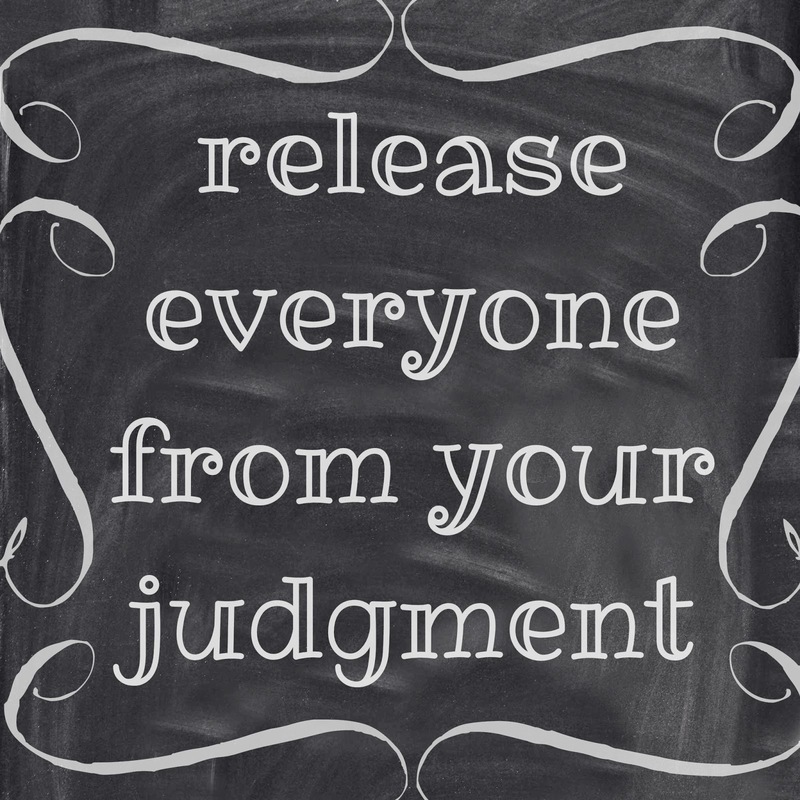 Find some freedom by releasing others from our judgments. Find freedom by freeing others. I love this post so much. I struggle with anxiety. At times it gets so difficult to think or to just get through the day. I will physically get sick. My word for the year is Peace. And it's not an easy word to love by. It takes hard and heartfelt prayer and a constant open consciousness of the Lord in my heart and mind. I try to give it all to Him and remember that he's in control no matter what crazy things are running through my head. This has saved my sanity. God Bless. Crystal, you continue to be uplifting in your unique and beautiful way! I hear you loud and clear. My word is balance, never easy after leaving the dance studio ... all or nothing. It is a HUGE lesson for me. I hope I am even a smidgen as graceful with my lessons as you are with yours. Thank you for your insights, and for sharing them. You have such a way with words. So well written! !